“Whatever it takes.” Mario Draghi’s declaration that he would save the euro could well go down as the most effective three-word statement by a Roman since Julius Caesar’s veni, vidi, vici. The president of the European Central Bank’s statement, followed up with a portentous and vaguely threatening — “and believe me it will be enough” — was made in July 2012. Almost two years later, Draghi’s intervention is widely regarded as the turning point in the euro crisis. Investors who were running screaming from the eurozone in the summer of 2012 are now rushing back in. But whatever the thundering herd of investors may think, it is too soon to declare that Draghi has won the war for the euro. The eurozone still faces deep underlying economic and political problems that are beyond the control of the president of the ECB and his colleagues. 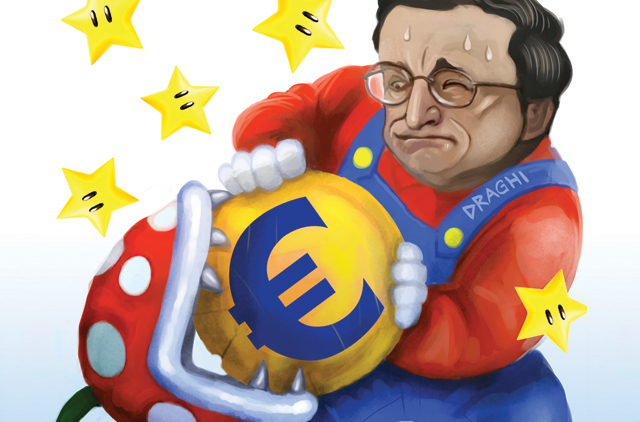 What Draghi has managed to do is to buy the euro some time. The borrowing costs of Spain, Italy and even Greece have fallen sharply — easing the pressure on their economies and government finances. But the underlying economic situation in many eurozone countries is still grim. And the political consequences of prolonged slumps are only just beginning to emerge. When I asked one of Europe’s most influential economic policymakers recently whether the euro crisis really is over, he replied: “No, it’s just moving from the periphery to the core.” The argument is that while worries about Portugal, Greece, Ireland and Spain have become less acute, concerns about Italy and even France should actually be rising. The statistics for Italy, in particular, are shocking. Since the onset of the crisis in 2008, Italy has lost 25 per cent of its industrial capacity and the real level of unemployment is now, according to senior Italian officials, about 15 per cent. Italy’s scope for economic stimulus is limited by EU rules and by the fact that the country’s ratio of debt to gross domestic product is now more than 130 per cent. France’s economic statistics are less bleak but unemployment is still in double digits and the national debt is creeping up to the symbolic level of 100 per cent of GDP. The good news is that both Italy and France have just appointed charismatic new prime ministers, with liberal economic views. But while Matteo Renzi in Italy and Manuel Valls in France are relatively popular, as politicians go, they are also both operating in countries that are notoriously resistant to liberal economic reforms - and against a backdrop of rising support for illiberal, anti-establishment political parties. It is far from clear that a dash of youthful vigour will allow Renzi to bust through systemic barriers that defeated well-intentioned predecessors such as Mario Monti. As for Valls, he has already worried economic liberals by promoting Arnaud Montebourg, the most flamboyantly leftwing minister in the French government. The new Italian and French prime ministers are also under threat from external political forces — in the form of a potential clash with the EU, and a potential shock from events in Ukraine. Both Italy and France are increasingly chafing at the budgetary constraints imposed on them from Brussels, and policed from Berlin. Renzi argues that Italy’s problem is not deficit spending but a lack of economic growth, which is making its debt burden ever more crushing. President Francois Hollande of France is said to have argued that the EU can have a live France with a deficit of more than 3 per cent of GDP or a dead France that has succeeded in meeting the EU’s budget constraints. However, those arguments are unlikely to be met with much sympathy in Germany. A further struggle looms over whether Draghi and the ECB can counter the threat of deflation with a European version of quantitative easing. Draghi seems to be edging towards such a policy. But he too faces deep scepticism in Germany, whose finance minister, Wolfgang Schauble, bluntly insists that Europe does not have a deflation problem. Indeed, one of the paradoxes of Draghi’s situation is that while he is regarded as a hero in financial markets and in much of Europe, he is still treated with deep suspicion by much of the economic establishment in Germany - which happens to be the country in which he lives. Draghi is said to find this situation wearing. All of these conflicting forces mean that the political and economic situation of the eurozone remains finely poised and vulnerable to a significant external shock. A worsening of the Ukraine crisis could deliver precisely that shock. If Russian forces move into eastern Ukraine - and, unfortunately, the signs are mounting that this may be imminent - then the EU will be forced to impose tougher economic sanctions on Russia. The Russians can be expected to retaliate by using the most powerful weapon they have at their disposal: energy. Much higher energy prices would have a severe impact on Europe’s fragile economy. And a return to deep recession would almost certainly favour the radical fringes in Europe. Unfortunately, Draghi has no sway over the Russian government — and not that much influence over the domestic politics of France, Italy or Germany. Yet developments in all of these nations could yet reverse the progress in the eurozone that the ECB president did so much to engineer. I do not doubt that Draghi will try to do “whatever it takes”. I just fear that, ultimately, it may not be enough.